Biohybrid robotics offers the possibility of compliant, bio-compatible actuation and adaptive behavioral flexibility via the use of muscles as robotic actuators and neural circuits as controllers. 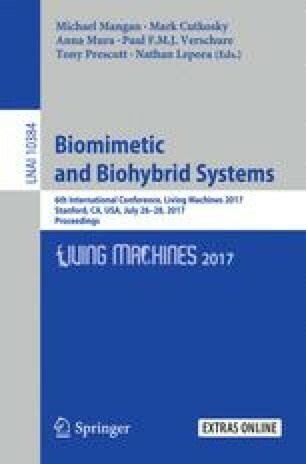 In this study, neuromuscular tissue circuits from Aplysia californica have been characterized and implemented on 3D-printed inchworm-inspired biohybrid robots, creating the first locomotive biohybrid robots with both organic actuation and organic motor-pattern control. Stimulation via the organic motor-controller is shown to result in higher muscle tension and faster device speeds as compared to external electrical stimulation. The authors would like to thank Yanjun Zhang for assistance in actuator characterization. This material is based upon work supported by the National Science Foundation Graduate Research Fellowship under Grant No. DGE-0951783 and a GAANN Fellowship (Grant No. P200A150316). This study was also funded in part by grants from the National Science Foundation (Grant No. DMR-1306665), and the National Institute of Health (Grant No. R01 AR063701).